Today we bring you the last of our Californian teams, the San Jose Sharks. After losing their all time leader in almost every single franchise statistic, Patrick Marleau to the Toronto Maple Leafs, the Sharks were missing their identity. After a middling start to the season going 10-10-0 the Sharks found themselves swimming aimlessly in the middle of the Pacific (division). 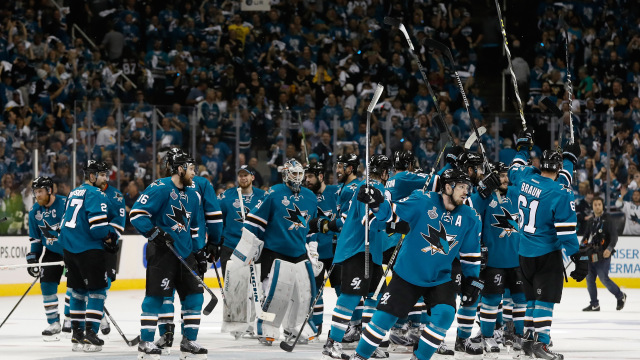 These were not the same San Jose Sharks that had been to a Stanley Cup final two years prior. Age started to show, bringing injuries to the two oldest players on the roster, Joe Thorton (38) and Joel Ward (37). After scoring 29 goals and capturing his first Norris the year prior, Brent Burns would go his first 20 games without registering a goal finishing the season with 12, his lowest amount in a full season since 2011-12. Burns would still finish the season with 67 points and 55 assists 2nd in D scoring only to John Carlson. The season would take a turn when Doug Wilson went out and traded for the controversial Evander Kane. 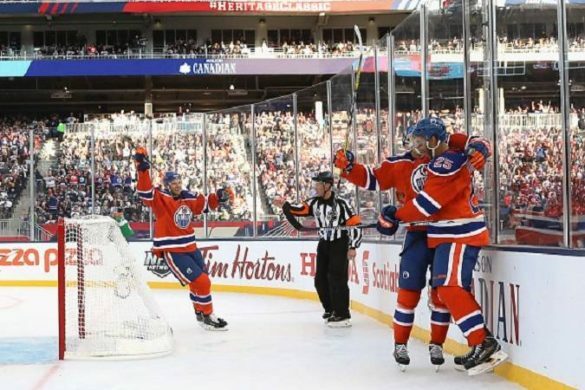 Kane made his debut February 27, against the Edmonton Oilers putting up 2 assists in the game. In the 17 contests Kane suited up for the Sharks had a record of 11-5-1 propelling San Jose into the playoffs, while Kane put up 14 points (9G,5A). I’m sure San Jose would tell you that their summer could of been better. 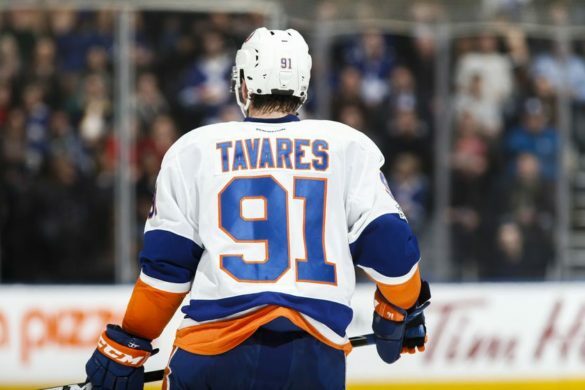 They swung on Free Agent John Tavares and missed, swung on Ilya Kovalchuk and missed. Just when it seemed they got a hit by trading for Hoffman, they inexplicably flipped him to the Florida Panthers for picks hours later. They managed to lockup key assets such as Kane and Couture but at 15 million combined for two players that have been near a point per game might seem a little steep. Buying out Paul Martin gave San Jose some cap relief. 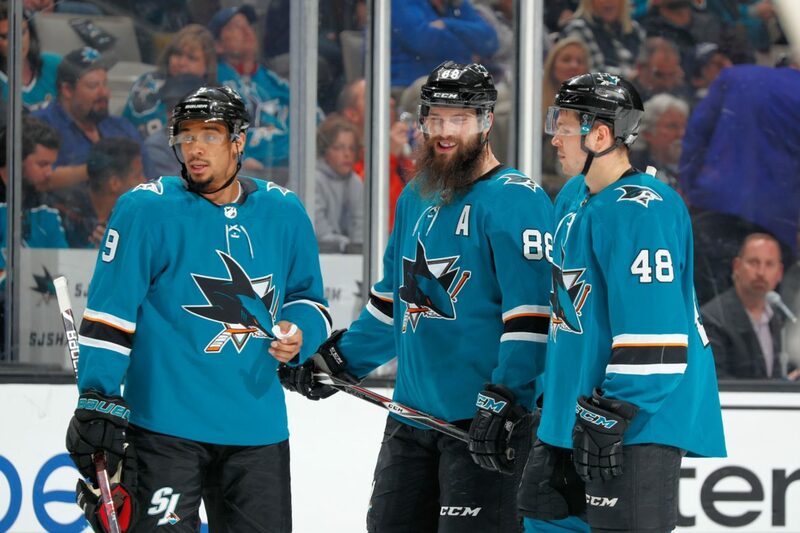 One thing I would of liked to see the Sharks do would be to get younger, most of their core; Vlasic, Pavelski, Burns, Braun and Thornton are all on the wrong side of 30 and their window to win the cup is starting to shut. The summer is not over yet though, San Jose who could still swing for the fences and trade for Erik Karlsson, as it appears Ottawa is ready to have a fire sale. San Jose does not have a 1st round pick this year but they do next year as well as two second-rounders. I could see a package from San Jose that focuses on Ryan Merkley. Last year was a coming out party for Meier, the former 9th overall pick scored over 20 goals and topped 30 points in his freshman season. Meier has great net front presence as 18 of 21 goals came from within 20ft of the goaltender. His hand eye is also something to behold as all four of his PP goals were deflections. 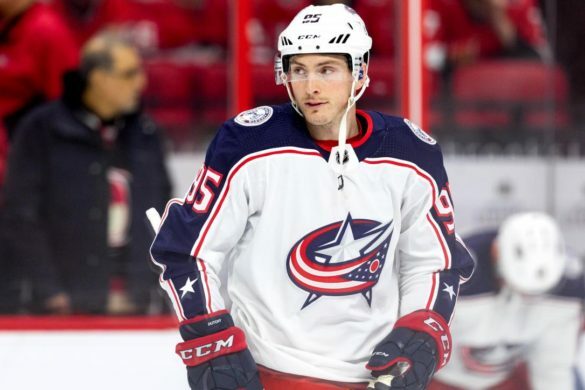 It’s not just in tight or off rebounds he can beat you, Meier has a very accurate wrist shot that may not come with blazing speed but is deceptive thanks to his quick release. I would look to Meier to continue his goal scoring abilities in the NHL, being a left shot RW on a team of centres gives Meier all the advantages to become a 30 goal scorer. Tomas Hertl has been the ideal candidate to make the leap into 60 point territory since his rookie season, we can also credit Hertl with helping provide perhaps the best Joe Thornton quote ever. I’ll leave you to find that yourself. He’s a flashy scorer, strong on the puck and uses his backhand quite often to score on goalies in close as its almost impossible to read coming off his stick. Hertl has left me wanting more several years now because I feel there is a potential in him thats yet to be tapped. 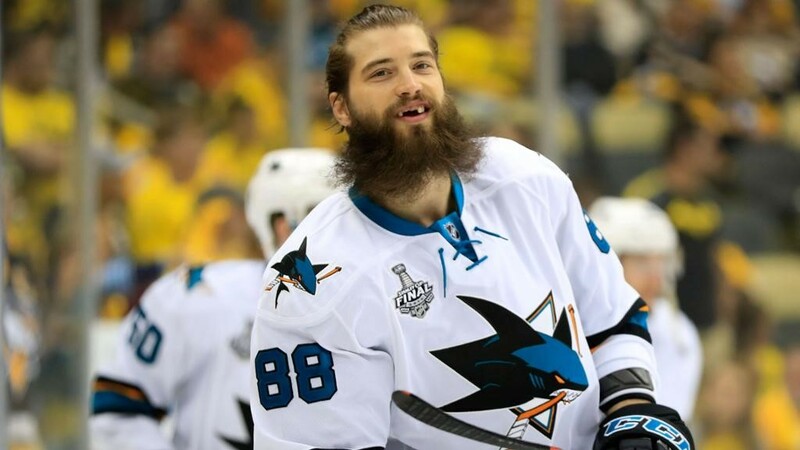 Heading into what is his 6th NHL season, it is time for him to turn the corner and join some of his other San Jose teammates like Pavelski and Couture and start filling the net. There are as many as 5 Sharks with the skill and shot to score 30 goals next year and ill book Hertl as one of them. Last season feels as if it was a bit of an anomaly for Braun. Entering the year with a career average of under 17 points, Braun essentially doubled his production while playing essentially the same minutes he’s become accustomed too. The number that really stands out for me is his negative Corsi over the last two seasons, 46.5% in 2017 and 45.6% in 2018, his regular defensive partner Vlasic managed almost 3% better in the same amount of contests. The saving grace for Braun is that he is not a power play player and all 33 of his points did come at even strength. This year I could see 2018 1st-round selection Ryan Merkley coming into camp and stealing ice-time from some defenders included Braun who plays on the same side. There’s no way in hell Burns will go his first 20 games without a goal and that makes all the difference to a team that struggled to score to start the year. As well, Evander Kane in his first full season with San Jose should easily eclipse the 30 goal mark for the first time in his career, 29 is his career high. There are a lot of teams that are going to struggle in the basement of the Pacific like; Vancouver, Arizona and Edmonton. The Sharks will smell blood in the water and take the division by hold during the 1st quarter of the season. 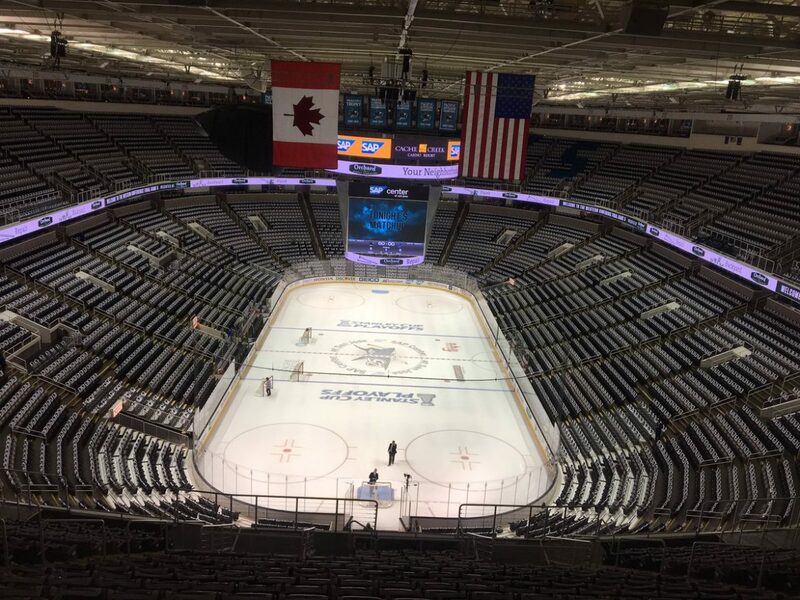 San Jose is not getting any younger and you have to wonder if this is the year they can finally get it done and make the Stanley Cup Final for the second time in the last four years. There are not many players that I would rather see get to hoist the Stanley Cup other than Joe Thornton. Thornton is already a first ballot hall of famer but a cup would cement his legacy and keep him away from the Mats Sundin comparisons. I am not rooting for the Sharks to win the West but expect them to make it through to the 2nd or 3rd rounds. 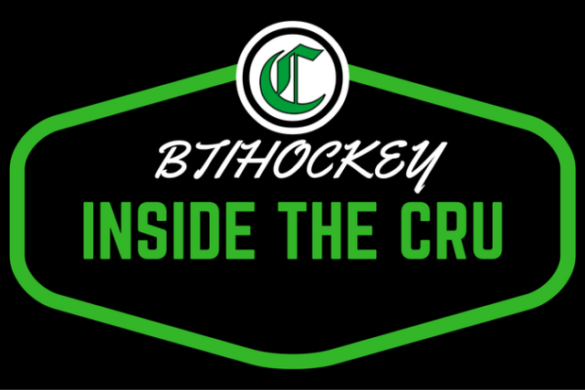 Come back tomorrow when on day 7 of NHL 31 IN 31, our own Jordan Clarke covers the Vancouver Canucks. The Sharks finished the 2017-18 season one point away from second place in the Pacific Division. They finished with 100 points, one behind the Ducks with 101 and Vegas who won the division with 109. Two rounds into the playoffs those same Golden Knights would eliminate the Sharks in six games. The 100 points to end the year was only one more than their total from last year, with San Jose holding onto their third-place spot in the division. This Sharks team seemed like it may have had more potential than last years, however. San Jose fell in the top ten in goals for and against as well as in the top ten in powerplay and penalty kill percentage. They made a trade at the deadline for Evander Kane who started producing right away. Kane tallied 14 points as a Shark alone in the last few months of the season. Joe Pavelski, Logan Couture and Tomas Hertl all had career years in terms of points in 2017-18 with Brent Burns tallying the third most of his career. The Sharks were a veteran-led team who were two years removed from a Stanley Cup Final appearance. 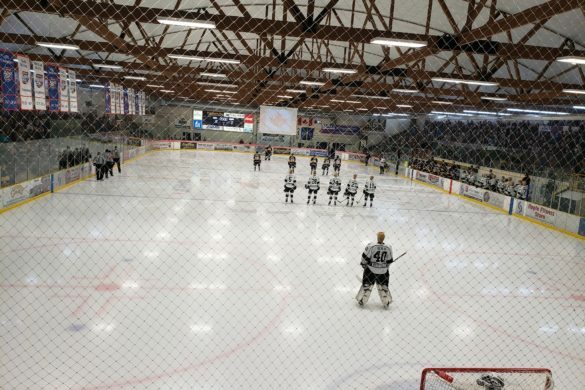 In the first round, they faced the Anaheim Ducks and handled them easily. They swept the Ducks and totalled 16 goals in the first round and held Anaheim to just four. Despite not having Joe Thornton for the playoffs San Jose was able to get plenty of production elsewhere. Through both rounds, Couture (12pts-4G-8A) Hertl (9pts-6G-3A) and Pavelski (8pts-2G-6A) led the fish in points. They also got some dominating performances from goaltender Martin Jones. Jones finished with a .926 SV% and 2.29 GAA. Anaheim had a total 132 shots through four games but never scored more than two goals in a game. Marc-Andre Fleury. Mostly. The Flower has been a machine these playoffs and was an absolute wall through most of the second round. In the games, the Sharks lost in this series it seemed in most cases that it would be impossible to score on Fleury. The Sharks pushed two games into OT, winning one and losing the other. They then won Game 4 by a 4-0 score. In Game 4 Jones was particularly masterful stopping all 34 shots he faced. Despite the blowout loss in Game 1, this was a hard-fought series that I expected to go one more game. Vegas has proven that their group of misfits can score. And a lot. Game 1 was a lopsided 7-0 blowout win. The Golden Knights outscored the Sharks 22-14 throughout the series. 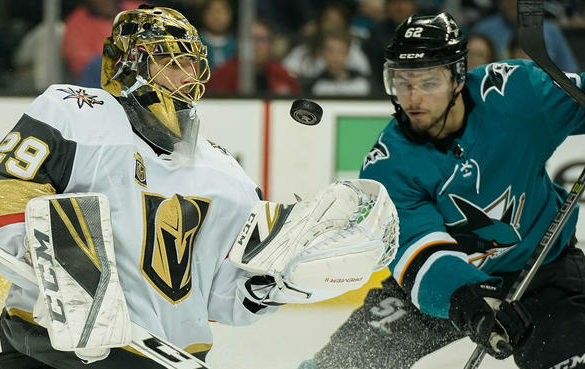 When it came down to it in an elimination game, San Jose was shutout in Game 6 as Vegas scored three times on 32 shots and Fleury earning the 28 save shutout. The underdog Knights proved to be too much for the ageing veteran Sharks. Yes. The Sharks don’t have a tonne of free agents heading into the offseason. Joe Thornton and Evander Kane are the two of the most significant names to hit the market. The biggest task will be coming to terms with the most significant name on the list. Tomas Hertl is an RFA, and San Jose will have to make it a priority to lock up their Czech star. 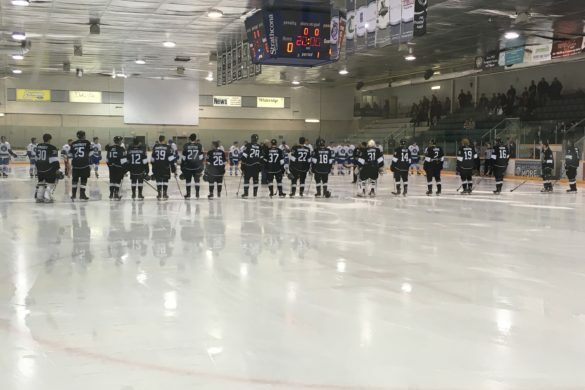 The Sharks have a roster where the bulk of the talent is still young and in their prime. Logan Couture (29) Mikkel Boedker (28) Joonas Donskoi (26) Tomas Hertl (24) Timo Meier (21) Marcus Sorensen (26) and Martin Jones (28) have yet to reach 30 years old. With a group of young talent and a solid veteran goaltender who’s looking like he is starting to enter his prime don’t count the Sharks out. With the ageing Ducks looking less promising for the future San Jose is looking poised to challenge Vegas next year for the Pacific Division title. The window may not be open for long with a combined 12 UFA’s and RFA’s going into the 2018-19 offseason. So, look for San Jose to make a run next year while they have the majority of their roster in place. 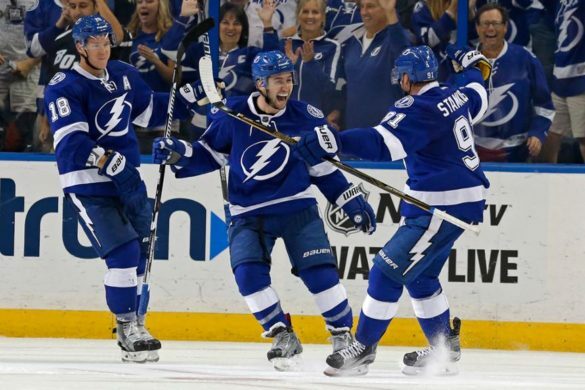 Day 17 of the Stanley Cup Playoffs saw plenty of action and drama with Boston out-powering Tampa Bay in Game 1 of their series and the Sharks fighting back after a disappointing loss in Game 1. Plenty of goals were scored with a total of 15 between both games. Coming into this series the common thought was this would be a powerhouse match-up between two of the best teams in the Eastern Conference. However, much like the Nashville and Winnipeg game the night prior, it was a little one-sided. Despite outshooting Boston 36-24 the Lightning could not solve the great play of Tuukka Rask who stopped 34 of the shots he faced, including some outstanding saves early in the first period to slow down a heavy Tampa attack. After Ryan Callahan was called for tripping, Boston capitalized on the powerplay. Rick Nash scored his second playoff goal as a Bruin, off of a beauty back-hand deflection on a David Pastrnak point shot. 1-0 Boston with 2:49 left in the first period. The Bruins would add to their lead 42 seconds into the second period. Patrice Bergeron rifled one past Andrei Vasilevskiy after being set up from a cross ice pass, again from Pastrnak. Tampa Bay got back into it two minutes later as former Ranger Dan Giradi blasted a shot from the point through five bodies in front of the net and over Rask’s should, blocker side to cut the lead to 2-1. Rick Nash would score his second of the game with 7:25 left in the second frame to pull Boston ahead 3-1. David Krejci set Nash up with a nice drop-back pass as the 6’4″ winger roofed one off the crossbar and in, for his third playoff goal as a Bruin. Tampa Bay would pull back within a goal once again, this time on the powerplay and in bizarre fashion. Mikhail Sergachev would blast a shot from the point past Rask. On the play however, Rask appeared to lose a skate blade and despite him losing his cool and tossing the blade across the ice, the goal was allowed. The goal however, would be the last for the Lightning as Boston scored again three and a half minutes into the third period. 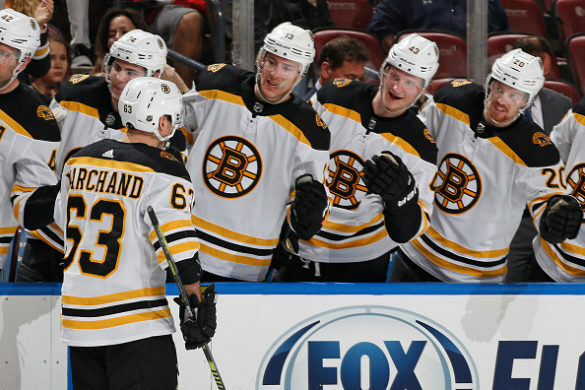 Brad Marchand deflected a Charlie McAvoy point shot into the net for a 4-2 Boston lead. Marchand would then set up Patrice Bergeron with a nice back hand pass into the slot to become the second Bruin along side Rick Nash, to score twice in the game. Jake DeBrusk would add an empty net goal as Boston pulled away to a 6-2 victory in Game 1. Tamp Bay peppered Tuukka Rask with shots, especially early but they could not find a way to beat the Bruins goaltender. If Rask can keep up that type of play, the scoring depth of Boston could make this a much shorter series than anticipated. Game 2 will be underway Monday at 5 p.m. MT from Amalie Arena in Tampa. After a more than convincing 7-0 win for Vegas in Game 1 it was tough to determine what would happen in Game 2. Especially after Evander Kane was suspended for two games for his high cross-check on Pierre-Edouard Bellemare. San Jose brought a tonne more offence with them for Game 2, throwing a barrage of shots at Marc-Andre Fleury. The Sharks outshot the Knights 47-29 on way to handing Vegas it’s first playoff loss in it’s very short franchise history. Despite being outshot early Vegas opened up the scoring with a goal from William Karlsson with two minutes left in the first period on a 4-on-4. It only took 26 seconds into the second period for Vegas and Karlsson to score again as he snapped a shot past Martin Jones from the face-off circle for an early 2-0 Vegas lead. The Sharks would then go on to score three unanswered goals. After David Perron was called for holding the stick the Sharks took to the powerplay and capitalized. Brent Burns blasted a shot from the point four seconds into the man-advantage cutting the Knights lead in half. On another 4-on-4 Tomas Hertl sent a beautiful spin pass into the slot for Logan Couture who sent the shot over the glove of Fleury to tie the game at two. The common trend in this game seemed to be 4-on-4’s with another coming with under six minutes left in the second. On a face-off in the Vegas zone, Brent Burns flew up into the play and took the puck around the net with speed and buried it on the wrap-around for his second of the game and a 3-2 San Jose lead. On the goal Vegas challenged for goaltender interference with Timo Meier bumping into Fleury, but the call on the ice was upheld and the Sharks held onto their one-goal lead. Vegas would tie the game with six minutes left, as Nate Schmidt hammered a shot from the point past Jones sending the game into OT. It was Schmidt’s second career playoff goal. With three minutes left in OT Jonathan Marchessault would score however, the play would be reviewed as Marchessault made contact with Jones knocking him over before putting the puck into the empty net. The play was overturned and the goal was waived off, sending the game into a second OT. Six minutes into the second OT frame the Sharks took to the powerplay and Kevin Lebanc sent a cross-ice pass to Logan Couture who sniped one past Fleury blocker side ending the game and tying the series at one a piece. 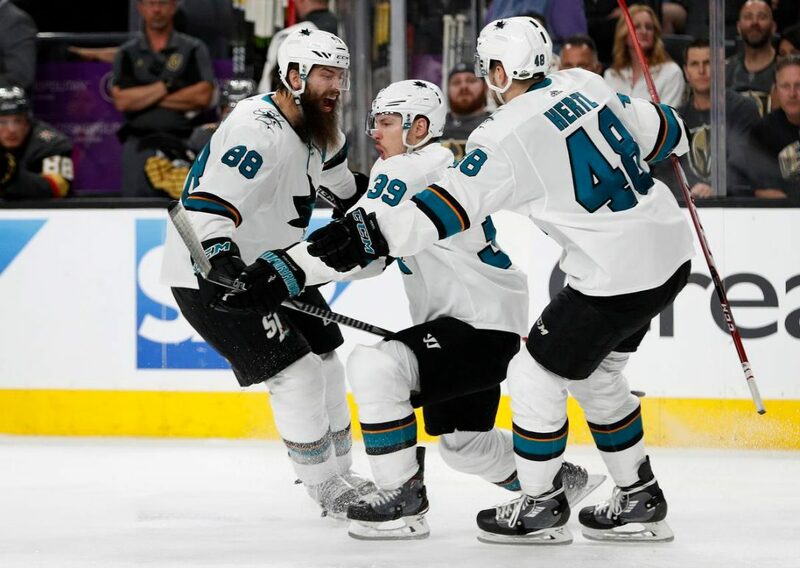 Game 2 was an all-around better showing than Game 1 and if the Sharks can play this kind of game, garnering that much offensive potential and throw the puck on net as often as they did, this could turn out to be the series we expected. Game 3 will be sure to be an exciting one and will take place Monday at 8 p.m. MT from the SAP Center in San Jose. 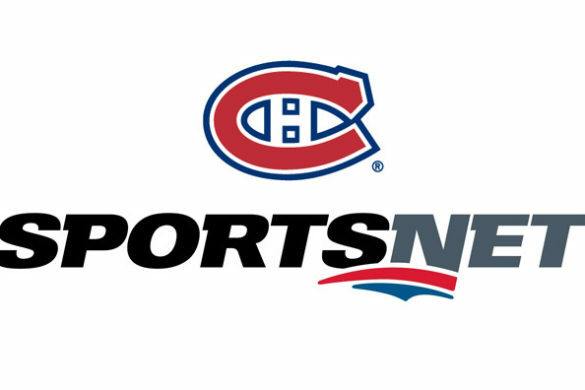 The offence was on full display on day two of the Stanley Cup playoffs with a total of 30 goals being scored. A number of star NHLers made their playoff debuts, with a couple lighting up the lamp. Burns ranks first among defenseman in Goals and Shots, indicating he is the driver of offense from the back-end. Both of his coaches in San Jose (previously Todd McLellan and currently Peter DeBore) have given 88 the green light to jump into the play regularly. Only 24% of his goals have come on the Powerplay, yet he is still ranked fifth among defenseman in this category. Shea Weber (44 Powerplay Goals; 55% of Goals on the PP), Oliver Ekman-Larsson (37 PPGs; 51.4%), Kevin Shattenkirk (26 PPGs; 54.2%) and Justin Faulk (25 PPGs; 48.1%) are the four names ahead of the Sharks rearguard. The aforementioned players rely heavily on the man-advantage to produce their goal scoring totals. They’re PP specialists and are rightfully among the league’s best D-men. However, Burns’ numbers don’t correlate with theirs; the Canadian produces more at even strength than any other defenseman over this span (bests 2nd place Erik Karlsson’s by 19 goals). Over these five seasons, Burns ranks 43rd among D-men in average Time on Ice. Burns is among the most efficient players in the NHL (more on this later). Among active defenseman, Burns’ 484 career points ranks sixth in scoring. He is the youngest player (31 years old) within these top-6 scorers. The bearded wonder finds himself in the Hart Trophy race among the league’s Most Valuable Players. 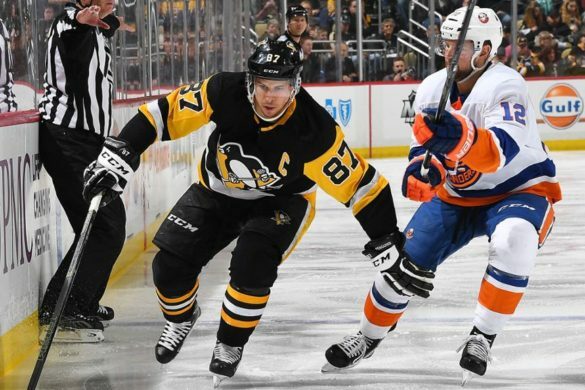 I wrote an article last week touching on the two-horse race between Sidney Crosby and Connor McDavid for the Hart; it’s safe to say that Burns has entered that conversation as well. Third overall in NHL scoring this season with 61 points. He finds himself tenth in goals and fifth in assists. One of San Jose’s on-ice leaders also finds himself leading the league in shots. Yes, shots! As a defenseman! Burns is also scoring at a very impressive 10.8 shot percentage this season. Sure, this number is expected to decline during the second half of the season, but with the number of shots he is producing, this expected change will not affect his numbers significantly. There are only nine skaters (with a minimum of 20 games) that are scoring above a 1.00 Points/Game clip. Burns’ 1.05 Points/Game ranks fifth in this regard. While the surface numbers above are certainly impressive, the underlying numbers suggest Burns’ impact is bigger than we think. The San Jose rearguard has been on the ice for 53.21% of his team’s goals this season. Simply put, the Sharks score when 88 is on the ice*. Burns is on the ice 37.81% of the time during Sharks games this season; this 15.4% margin (compared to the first bullet) is incredible. The large gap between the two numbers indicates Burns’ efficiency is among the best in the big leagues*. While his Corsi For % isn’t outstanding, the 52.57% still marks favourably for the Barrie, Ontario native. However, Burns’ Corsi For (1146) leads the league in this department (via NHL.com). To break it down: There is a total of 2180 Shot Attempts (from both the San Jose Sharks and opposing teams) while Burns is on the ice. Of this total number, the Sharks account for 1146 of them. Thus, 1146 divided by 2180 gives us a Corsi For % of 52.57%. 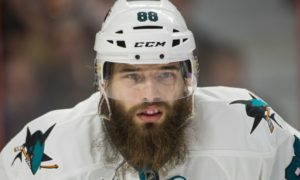 According to NHL.com, Burns’ Corsi Behind (+79) and Corsi Close (+111) indicates that Burns plays his best hockey when his team needs him most. To break it down: Corsi can also be reflected as positive and negative numbers. A Corsi of +79 indicates that Burns is on the ice for 79 more Shot Attempts For vs. Shot Attempts Against. Corsi Behind is only measured when the Sharks are behind on the scoreboard during play. Corsi Close is only measured when the Sharks are ahead/behind one goal or tied in the Third Period. 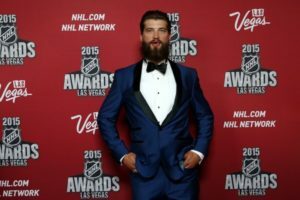 Certainly, it appears that Brent Burns is on his way to winning his first Norris Trophy as the league’s best defenseman. He leads the Sharks in scoring and is a big reason why they sit atop of the Pacific Division with a 34-18-6 record. Will he have enough traction to win the Hart Memorial Trophy as the NHL’s Most Valuable Player? Do you think he will steal the Ted Lindsay award (the best player voted amongst his peers) away from Sidney Crosby by season’s end? Leave your comments in the comments section below or tweet me at @TonyBrar_!